Chief Blumenauer began his career with the Midland Fire Department in 1998. He served in all ranks including Captain, Battalion Chief and Assistant Chief. Blumenauer was promoted to Fire Chief in December of 2017. He holds state certifications as a licensed paramedic, EMS Instructor, and TCFP Master Firefighter, Fire Officer II, Fire Instructor II and is also a graduate of the Texas Fire Chiefs Academy. He earned an Associates in Fire Protection Technology as well as a Bachelors of Organizational Management, each from Midland College. Chief Blumenauer is currently pursuing his Masters of Public Administration from Sul Ross State University. Chief Blumenauer's primary duties include overall budgetary responsibility for the Fire Department. He actively oversees the executive administrative staff in regards to strategic planning, budget development, policy implementation, project management, and team building and leadership activities. Chief Blumenauer's also works closely with all Midland City Department heads, including City Manager and City Council. Assistant Chief McGary began his career with the Midland Fire Department in 1992 and served in the ranks of Firefighter and Engineer before being promoted to Captain in 2005, and then to Battalion Chief in 2012. McGary holds certifications as a TDSHS Licensed Paramedic, TCFP Master Firefighter, TCFP Master Aircraft Rescue Firefighter, Fire Officer II, Fire Instructor I, NFA Incident Safety Officer, Blue Card Incident Command, and is currently enrolled in the Texas Fire Chiefs Academy. He earned an Associates degree in Fire Science Technology from Midland College. Assistant Chief McGary's primary duties include the direct supervision of the on duty Battalion Chief (or shift commander) and ultimate responsibility for all personnel and equipment assigned to the three battalions within the Operations Division. McGary will also oversee airport emergency operations through the Aircraft Rescue Fire-Fighting (ARFF) Coordinator. As a member of the executive administrative staff, he assists with strategic planning, budget development, policy implementation, project management, team building and leadership activities. Assistant Chief McGary also serves as the Chairman of the Board for the Midland Firefighter's Relief and Retirement Fund. 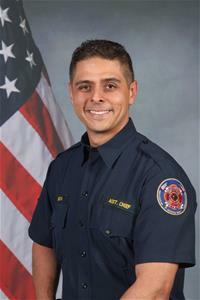 Manuel "Corky" Heredia became the Midland Fire Department's Assistant Chief of Support Services in March 2017, after serving as Training Chief since 2014. He is a Certified Fire TCFP Instructor III, EMS Instructor DSHS, American Heart Association Instructor, and Blue Card Incident Command Instructor. He holds a Midland College Associates Degree in Fire Science Technology and TCFP Fire Officer II Certification. Chief Heredia was born and raised in Midland. He graduated from Midland High School in 1985 followed by a brief stint at Midland College to pursue a degree in Business Administration. He received his EMT certification in 1990 and was hired by Midland Fire Department in 1991. Chief Heredia enjoys spending time with his wife and three daughters in his spare time and calls his employment with the Midland Fire Department one of the most rewarding experiences in his life. 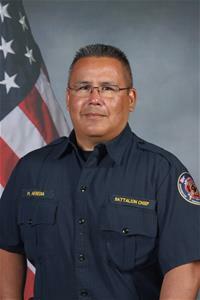 Assistant Chief Michael Cota has served with the Midland Fire Department since February of 1996. His career in suppression as a Firefighter and as an Investigator in the Fire Marshal's Office has offered him an opporunity to serve in an array of disciplines for the City of Midland. Chief Cota holds TCFP Master certifications as a Firefighter, Arson Investigator and Fire Inspector. He also holds certifications as a Fire Instructor I and Fire Officer I, while maintaining an EMT-I and Peace Officer license. Chief Cota is a graduate of the Texas Fire Chiefs Academy and Certified Public Manager program through Texas Tech University. He has earned an Associate Degree through Midland College and is currently pursuing a Bachelor Degree in Business Administration. Chief Cota's duties since joining the executive administrative staff his duties include overseeing the Community Risk Reduction program and manages the Fire Marshal Office. He does so while balancing relationships with internal and external resources to make a positive difference in the lives of our citizens. Chief Cota is also responsible for departmental functions such as policies, budget, health and wellness initiatives and strategic planning. Chief Cota has held a long standing seat as the Chairman of the Board for Midland Municipal Employee's Credit Union and is the Secretary/Treasurer of the Midland Fireman's Relief and Retirement Board. Chief Cota spends most of his spare time mentoring young athletes by instilling teamwork, accountability and discipline while coaching his son's football and baseball teams.